How Was The West Won? With Hospitality Fred Harvey was the Ray Kroc before McDonald's, the J.W. Marriott before Marriott Hotels. A new book by Stephen Fried looks at how Harvey civilized the West with his railroad restaurants and changed America's eating habits. 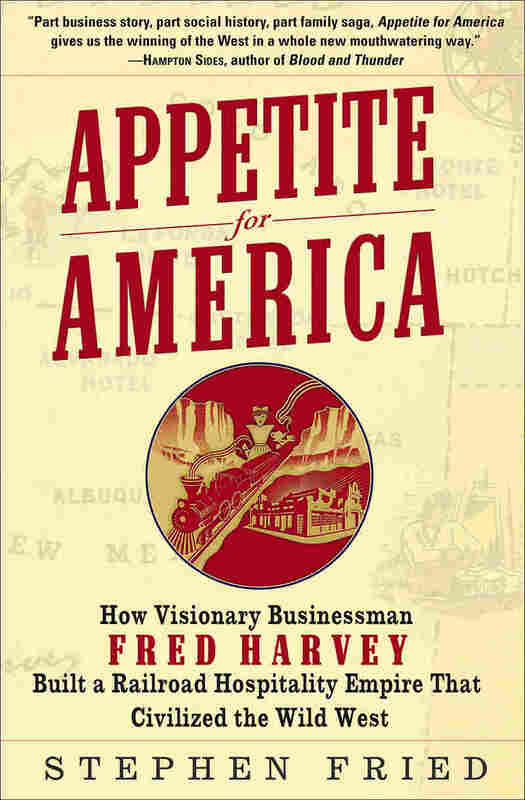 Fred Harvey was an 1800s culinary innovator who believed he could serve the finest cuisine in the middle of nowhere, according to Stephen Fried, who wrote about the restaurateur in Appetite for America. Before Harvey, food available for train travelers was subpar at best, and Harvey had suffered "culinary indignities" along the rail lines himself. "The food was awful," Fried tells NPR's Melissa Block. "And what they would often do is they would serve it to you so late that by the time you sat down, it was time to get back on the train." He adds, "They would actually scrape the food off the plate and serve it to the next person who came in and got tricked the same way." "The idea here was that these restaurants should be as good as the best restaurants in New York, in Chicago, in London, and that's where the chefs came from and that was the level of ambition," Fried says. In Harvey's heyday, you could ride in grand style on the Santa Fe railroad, get off at, say, Dodge City, Kan., and step into the depot for a fine meal at a Fred Harvey restaurant. "One of the innovations of Fred Harvey was to have one company that had all the restaurants along one railroad line, and they had to be accountable along the way because you were always going to see Fred Harvey," Fried says. By its peak in 1928, the Fred Harvey empire ran nearly 100 restaurants and 25 hotels from Chicago to Los Angeles, not to mention newsstands and bookshops in more than 80 cities. He set an impeccable standard for service and quality: the Fred Harvey Way. It is a violation of our instructions to use less than eight ounces of ground coffee per gallon. Coffee should be ground medium fine, but not so fine as to contain a flour dust. Your water must be boiling hot, and the water urn should show evidence of the boiling by the steam popping off through the top. When you can see the steam coming out under pressure from the top of the water urn, that is a sign that the water is right for making coffee. If you make four gallons of coffee, pour four gallons of water over rapidly, keeping the urn covered between each pouring so as to retain all the heat. Let this four gallons of water percolate over and through the coffee thoroughly and when the entire four gallons of water have run through, then start to pour over again. If everything is right, at the end of the second pouring the coffee should be finished and be up to the standard. If you do not allow all the first pouring to run through before you start the second, you are very apt to spoil the coffee because when drawing off the second pouring, the stream comes out thin and gets cooled between the faucet and the vessel, with the result that the quality of coffee is immediately adversely affected. Remove skin, dismember bull frog, cut into desired pieces, season with salt and pepper, dip in flour and saute in butter and one crushed garlic kernel, a few minced shallots, one chopped onion and three sliced fresh mushrooms. Add a few fresh tomatoes, peeled and diced. Let simmer until frog legs are tender, season with salt and pepper and finish sauce with chopped parsley and olives. Serve in chafing dish. There were three choices at Fred Harvey restaurants: a sit-down dining room where even cowboys needed to wear jackets to eat; a lunchroom that would have been similar to today's diners; and a place for takeout coffees and sandwiches. To make people understand the importance of doing things perfectly in the early years of his restaurants, Harvey would run to the front of the train, hop off and walk to the restaurant before the passengers arrived. "If he found the slightest thing wrong, he would basically take the tablecloth, yank it, and throw the entire table on the floor so that the people would have to pick everything up, clean everything up, and reset the table before people came into the restaurant," Fried says. After a time, Harvey didn't have to pull the tablecloths. Even so, the workers in the restaurants had a system to warn others that he was coming. "Sack of potatoes on next train" was one of the many telegraph message codes to let people know at the next station that Harvey was on the train. One innovation that Harvey put into effect was the Harvey Girls. 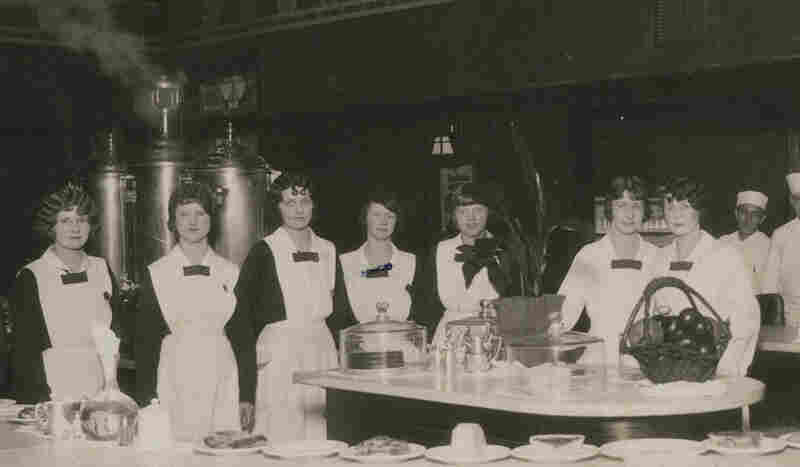 They were women who rode the trains to go work at a Harvey restaurant out West. In the 1946 movie, The Harvey Girls, it was said that the women were "conquering the West with a beef steak and a cup of coffee." Harvey believed that the Harvey Girls were civilizing the West. The Harvey girls began in the 1880s in part because the company was expanding into rough New Mexico. "In New Mexico, all waiters at that time were African-American men, and there was an incredible amount of racism," Fried says. Stories in the newspapers said these men would have to carry guns to protect themselves from their customers. Harvey decided that his company would hire only single women from the Midwest, train them in Kansas and ship them out to the different restaurant locations. They would sign a contract that they wouldn't get married for six months and they would live together in barracks. "This is the first real female workforce in America," Fried says. "The first opportunity for single women to travel, to make their own money. And the company continued this practice through the late 1930s." Fried says that it's estimated 100,000 women were Harvey girls. Little of Harvey's empire is left, but some of his hotels are still around in the Southwest. And some communities in the West are reclaiming their own Fred Harvey buildings so that they can be used as restaurants, hotels or municipal buildings. "Every time my wife and I fly, and we get off the plane to the horror of being an air passenger and ... she always turns to me and says, 'Where is Fred Harvey when we need him?' " Fried says. WHO THE HELL IS FRED HARVEY? On that spring night in 1882, the drunken cowboys riding through northern New Mexico could have been forgiven for squinting in disbelief at the sight of the Montezuma Hotel. It did appear to be a hallucination. The Montezuma was one of the most astonishing architectural creations in America -- although perhaps most astonishing was its location. It was nestled in a gorgeous middle of nowhere, in the foothills of the Sangre de Cristo Mountains six miles outside of Las Vegas, New Mexico, an old Santa Fe Trail town that the railroad had only recently connected to civilization. The largest wood-frame building in the United States -- some ninety thousand square feet, with 270 guest rooms -- the Queen Anne-style Montezuma featured a dining room that seated five hundred, a casino, a breathtaking wine cellar, eleven bowling alleys, a billiard hall, and an immense therapeutic bathing facility offering six different kinds of baths and douches, so patrons could fully experience the medicinal powers of the underground hot springs. The service at the Montezuma was brilliant, with staff imported from the best hotels in New York, London, Chicago, and St. Louis. And the cuisine was amazingly ambitious. The food combined the expertise of classically trained chefs from the restaurant capitals of the world with fresh regional American ingredients -- fruit, vegetables, and shellfish, as well as delicacies like green turtles and sea celery harvested by pearl- diving Yaqui tribesmen -- to which few other kitchens in the country had access, and which most chefs wouldn't come to fully appreciate for almost another century. Open for only a few weeks, the resort was already attracting dukes and princesses and presidents, who quickly booked passage on the Atchison, Topeka & Santa Fe, the upstart railroad whose newly laid tracks were the only way to get there. In front of the Montezuma was a large park, exquisitely landscaped with shade trees and rare flowers, planted in three train- car loads of imported sod and topsoil. At the center was a huge fountain, flanked by lawns for tennis and croquet, an archery range, and even a zoo, where the deer and the antelope literally played. The free-form park was illuminated, as was the building itself, by thousands of gaslights fed by the hotel's own generating station. So when "Red John" and his men approached on horseback that evening, they couldn't believe their bloodshot eyes. The cowboys rode first to the park, where they hollered and shot their guns in the air while galloping across the manicured bluegrass and graveled walks. The commotion could be heard throughout the hotel, from its grand entranceway to its cavernous main dining room. There it reached a tall, slim man in his mid- forties, with a perfectly groomed Van Dyke beard, deep, cautious eyes, and senses that were always cocked. He tried to ignore the noise and enjoy his dinner, but soon threw down his linen napkin and rose abruptly from his canebacked chair. The man was dressed fastidiously in a dark blue suit with a waistcoat and dangling watch fob, the formal uniform of a Victorian gentleman from his homeland of England. But he walked quickly, with the nervous energy of America, drawing the attention of the dining room staff and some of the guests as he passed. By the time he left the dining room, the cowboys had dismounted and were running riot through the hotel. He could hear them in the billiard hall, where they were taking target practice with the Indian relics and curios displayed above the bar, and shooting the tops off the private- label liquor bottles on the sideboard. "Boys, put up your guns!" the Englishman called out, striding into the room. "Who the hell are you?" Red John yelled. "My name is Fred Harvey," he replied. "I run this place. And I will not have any rowdies here. If you don't behave like gentlemen, you can't stay here and you can't come again. Now put up your guns and take a drink with Fred Harvey!" Although he had been in America for thirty years, Fred still retained his British accent, which made some Westerners titter. But as the cowboys laughed, cursed, and taunted him, and hotel guests started gathering, he walked over and grabbed Red John by the collar. In a single motion, the fastidious Englishman yanked the dusty desperado over the bar and pinned him to the floor. "You mustn't swear in this place," he told the stunned cowboy. There was a moment of silence -- and then Red John told his men to stand down. "Fred Harvey is a gentleman, boys," he declared, brushing himself off. "I say, let's have those drinks." When the drinks were done, they were served a midnight breakfast as well -- the breakfast for which Fred Harvey was becoming famous. The freshest eggs and steak available in the country, shipped directly from farms in refrigerated train cars. Pan-size wheat cakes stacked six high. Quartered wedges of hot apple pie. And cup after cup of the best damn coffee these cowboys had ever tasted in their lives. Red John and his men never made trouble at the Montezuma again. But they still wanted to know, as did more and more people across the country: Who the hell is Fred Harvey? More than a century later, I am peering over the lip of the Grand Canyon in my pajamas at five o'clock in the morning. And I'm wondering the same thing. As the sun slowly illuminates the canyon walls, I am reminded of why there is substantial literature just explaining why words cannot describe what I'm seeing. But as I turn away from the canyon, I take in another sight -- less awe inspiring but in many ways equally intriguing, because it was created by man, by Americans, and plunked here on the very edge of the Divine Abyss. It is El Tovar, the rustically majestic hotel that has afforded me the luxury of rolling out of a plush bed at sunrise, shuffling in my slippers down a carved oak staircase, and stepping outside to have the Grand Canyon pretty much to myself. El Tovar is, arguably, the most in-demand hotel in the world: Most of the guest rooms are booked up more than a year in advance, and an astonishing number of trips are planned around their availability. El Tovar is also one of the last places where Fred Harvey lives on. The founder of the family business that created this hotel -- and America's first hospitality empire -- he still symbolically oversees every detail of its daily life, from his moody portrait hanging in the main lobby, next to where the maître d' arrives each morning at six thirty to greet the throng of tourists queued for the renowned breakfast-with-a-view. In the painting, he looks formidable and, frankly, a bit anxious, a clenched fist protruding from his black waistcoat. Most visitors to the Grand Canyon don't have an inkling of why the Englishman in this portrait matters, or how he changed America. They are not aware that there was a time, not that long ago, when Fred Harvey was one of the most famous and intriguing men in the country --" a food missionary," as one prominent New York critic called him, on a quest to civilize the United States one meal at a time. They don't know that his waitresses -- the legendary Harvey Girls -- were the first major female workforce in America, allowing single women for the first time to travel independently, earn a decent living, and, over time, help settle the American West. They don't know that his restaurants, his hotels, and his Harvey Girls were once so much a part of American culture that in the 1940s his legend spawned a best-selling novel, and then an Oscar-winning MGM musical starring Judy Garland at the height of her career, which had the whole country singing along with her about the joys of exploring America "On the Atchison, Topeka, and the Santa Fe." I was similarly unenlightened when I first encountered the Fred Harvey saga during a visit to the Grand Canyon in the early 1990s. I discovered him, as so many others have, in a sepia- toned photo in a hotel brochure. But then I started tripping across pieces of his story and his legacy in travels all over the country, although mostly in the areas that, as a born- and- bred Easterner, I think of as America's "better half ": the Southwest and the Midwest (which was originally the West, or at least the western frontier). Over the years, Fred Harvey has become something of an obsession, because it seems that the more I learn about him, his family, his business, and his world, the more I understand about my homeland, and how it came to be. Seen through the prism of the Harvey family saga, the late 1800s -- a period many of us slept through in high school history class -- become a powerful, riveting drama of a great nation expanding and uniting, one steel rail at a time. And the formative years of the "American Century" take on a different meaning. So, who the hell was Fred Harvey? An Englishman who came to America in the 1850s, he built a family and a career and then, in his early forties, started a revolutionary business feeding train passengers in the Wild West along the Santa Fe railroad. While he died famous and wealthy, he was also a curiosity -- a man out of time -- because at the height of the Gilded Age, he became something much better understood today: the founding father of the American service industry. That's why his story and his methods are still studied in graduate schools of hotel, restaurant, and personnel management, advertising, and marketing. He is especially popular in the buzzwordy fields of "branding" and "brand extension," because "Fred Harvey" was actually the first widely known and respected brand name in America, established years before Coca- Cola. 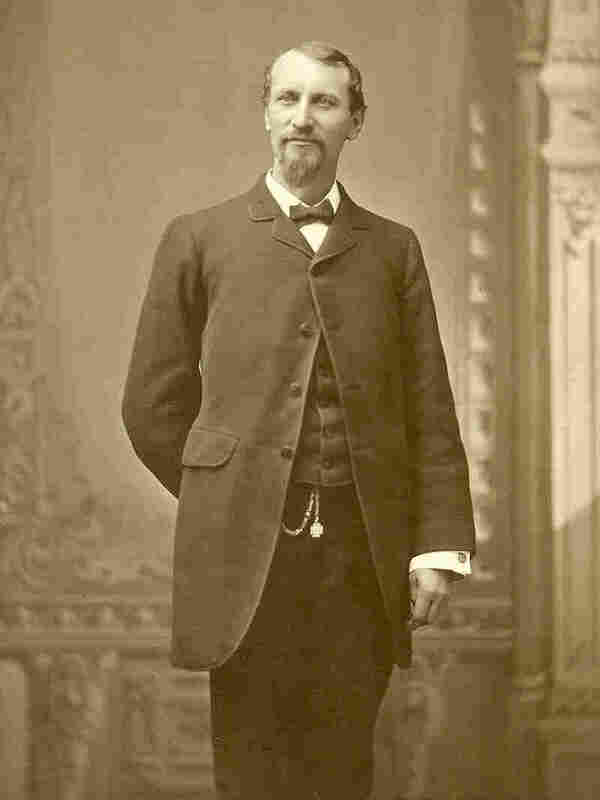 "Fred Harvey" is also the name of the company he founded. Not Fred Harvey Inc. or The Fred Harvey Company. Just Fred Harvey. Why that is turns out to be one of the great untold family business sagas in American history -- a tale not just about one brilliant, driven man and his empire but also about his largely unsung son Ford, who actually ran the company far longer than his father, but who stayed out of the spotlight so the public would think famous Fred was still alive, an ingenious marketing device. Because of Fred and Ford Harvey, this innovative family business played a crucial role in American culture from the post–Civil War era all the way through World War II. Fred Harvey ran all the restaurants and hotels along the country's largest railroad, the Santa Fe between Chicago and Los Angeles; went on to serve the nation's cross- country drivers on Route 66, the first superhighway; and even played a vital role in the formative, thrilling, and scary years of the airline business -- because Fred's grandson Freddy was an original partner in TWA with Charles Lindbergh and Henry Ford. Fred Harvey's "eating houses" were prototypes of the disparate dining experiences that characterize American eating: They had formal, sit- down dining rooms (in which even cowboys were expected to wear jackets), attached to large casual dining areas with long curved counters (the genesis of the classic American diner), attached to take-out coffee and sandwich stands (the original Starbucks). Yet this curious Englishman turned out to be more than just a brilliantly successful manager of hotels and restaurants and a true Horatio Alger story come to life (during the time when Alger actually was writing those stories). He created the first national chain of restaurants, of hotels, of newsstands, and of bookstores -- in fact, the first national chain of anything -- in America. But unlike the chains of today, the Fred Harvey system was known for dramatically raising standards wherever it arrived, rather than eroding them. It turns out that being a fast- food nation was originally a good thing. At its peak, Fred Harvey had over sixty-five restaurants and lunch counters, sixty dining cars, a dozen large hotels, all the restaurants and retail shops in five of the nation's largest railroad stations, and so many newsstands and bookshops that its prepublication orders regularly affected national best- seller lists. For many years, before highways and telephones and broadcast media connected the nation, there was only one thing that linked major cities as disparate as Chicago, Dallas, Cleveland, Kansas City, Los Angeles, St. Louis, and San Francisco, as well as small towns as far- flung as Needles, California; Joplin, Missouri; Raton, New Mexico; Purcell, Oklahoma; Rosenberg, Texas; and Chanute, Kansas. In each locale, the place to have dinner on a special occasion or simply a miraculous cup of coffee anytime was a Fred Harvey restaurant. Fred Harvey was Ray Kroc before McDonald's, J. W. Marriott before Marriott Hotels, Howard Johnson before Hojo's, Joe Horn and Frank Hardart before Horn & Hardart's, Howard Schultz before Starbucks. And from the moment in 1878 when he lured the top chef at Chicago's vaunted Palmer House to run his first high- end restaurant and hotel -- in a refurbished fleabag in Florence, Kansas, a town so small that the population often doubled when the Santa Fe train pulled into the station -- Fred Harvey's managers and chefs became some of the first hospitality heroes of America. When the son of Kaiser Wilhelm stayed at La Fonda, the legendary Fred Harvey hotel in Santa Fe, he was thrilled to discover in the kitchen Chef Konrad Allgaier, who had cooked for his family in Germany. Fred Harvey was also Walt Disney before Disneyland. He and his partners at the Santa Fe played a huge role in the development of American tourism as we know it. Fred Harvey was largely responsible for the creation of the Grand Canyon as the country's premier natural tourist attraction, as well as the development of the mythic Southwest and what grew into the National Park System. Fred Harvey was also the most important driving force in the early appreciation and preservation -- and, to some, exploitation -- of Native American arts and culture. Most of the Indian art and crafts now on display in the world's major museums were originally owned by Fred Harvey. And much of the silver and turquoise jewelry that we think of as indigenous was commissioned, and in some cases even designed, by the Fred Harvey company to sell in its myriad gift shops. Fred Harvey was also the first company to embrace Native American and Spanish- American imagery in architecture and design, inventing what is now known as "Santa Fe style." Many of the best-known paintings and photos, and much of the best writing about the Southwest and the West, were originally commissioned or enabled by Fred Harvey. The restaurants and hotels run by this transplanted Londoner and his son did more than just revolutionize American dining and service. They became a driving force in helping the United States shed its envy of European society and begin to appreciate and even romanticize its own culture. "More than any single organization, the Fred Harvey System introduced America to Americans," wrote a historian in the 1950s. And it's just as true today. Because, whether we know it or not, we still live in Fred Harvey's America. 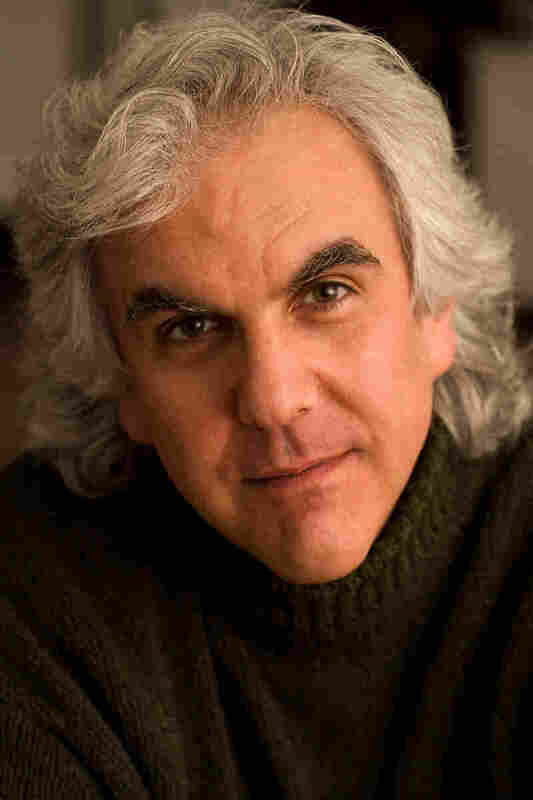 Excerpted from Appetite for America by Stephen Fried Copyright 2010 by Stephen Fried. Excerpted by permission of Bantam Dell, a division of Random House Inc. All rights reserved. No part of this excerpt may be reproduced or reprinted without permission in writing from the publisher.